RWN blogger Lee Doren has a new ebook out. It’s called Please Enroll Responsibly: Avoiding Indoctrination at College. Enjoy my interview with Lee! I learned from your book that you used to be a liberal and I am always fascinated with stories about how liberals became conservatives. Tell us about your story. It may surprise many people who know me today to discover that I graduated from undergrad as a liberal. I even voted for John Kerry and was a community organizer for an environmental lobbying organization before law school. Ironically, it was working with the environmentalists that started to change my opinion. One day I was canvassing a neighborhood in Toledo, Ohio to regulate or shut down a Sunoco refinery. What shocked me at the time was that almost all the people who opposed what I was doing were middle-class individuals who liked the cheaper gas and jobs that the refinery brought. They weren’t the stereotypical “Big Oil” executives that the Left always wants to demonize. After that I was no longer convinced that I was on the right side of the issue. During law school, I also started to read a lot of Milton Friedman, Thomas Sowell and researched FDR’s New Deal. I soon realized that almost everything I was taught about economics and the Great Depression was wrong. Big government was a colossal failure. It soon became clear to me that capitalism and free markets had brought people out of poverty historically, too. I wondered what else I wasn’t taught in the classroom, which prompted more reading and self education. Eventually, my views completely changed after two years. This quote from the book really jumped out at me, not just because I think it’s true, but because I have actually talked to a prominent, politically informed liberal who had never heard of Thomas Sowell. How much do you think this shapes liberal thinking? I think it summarizes most of the problem. It explains why many on the political Left really believe conservatives or libertarians are heartless. You cannot read Milton Friedman or Thomas Sowell and reach that conclusion. Most of Milton Friedman’s arguments are how to bring people up out of poverty. What’s not compassionate about that? Also, I can’t tell you how often I talk with my friends who self-identify as “liberal” who agree with my political views after actually taking the time to listen to me. What is hilarious is that I’m usually arguing mainstream conservative or libertarian ideas. If they really were “liberal,” or on the Left, they shouldn’t be agreeing with me. The truth is that they’ve never been presented these views. Sadly, I think those who actually are on the Left know this, which is why there has been a massive PR effort to demonize conservatives, libertarians and Republicans. Why read or listen to people who are evil? Glenn Reynolds over at Instapundit has talked a lot about a “higher education bubble” and in his new book, Mark Steyn outright scoffs at the idea that it’s worth it for people to spend so many of their productive years in college. So, let me ask you: Is college still worth the price? It really depends what classes you take. Too often freshmen undergrads are told they have plenty of time to decide what they want to do when they graduate. This results in them wasting their first two years in college taking worthless courses like, “Arguing with Judge Judy.” On the other hand, students who are interested in the hard sciences can get great value for their money. Also, a great English professor can turn anyone into an outstanding writer. Unfortunately, way too many students have $100,000 in debt after they majored in subjects that no employer cares about. College may not be for everyone, but if you are going to enroll, there are ways to make it worth your time. My thinking has always been that college students should avoid conflict with their professors over ideological issues because the liberals tend to have an ends justifies the means mentality and the professors have almost all of the power, while the students have almost none. So, in a case where you need a good grade, it doesn’t pay to go toe-to-toe with a professor. What’s your advice to students on that subject? I totally agree. Getting into wars with your professor is a total waste of time. You’re not going to change your professor’s mind in one semester. However, asking legitimate questions in class can impact the views of other students. If you ask a serious question without being confrontational, and the professor doesn’t give a good answer, other students will recognize that there are other relevant opinions on the matter. The scariest thing you said in your book is that, “Youtube Is A Microcosm Of What Students Learn.” That’s scary because YouTube’s section has one of the biggest pools of rude, crude mouthbreathers on the entire Internet. So, why do you say YouTube is a Microcosm of what students learn? To the best of my knowledge, students aren’t taught to be rude in the classroom. However, when I start reading the same talking points over and over in the comments, my first response is to ask where they came from. What’s their source? If I discover students learned these ideas from a classroom video or discussion, I see the true impact that these classes have. These classes impact how students see and interact with the real world. In fact, a huge part of the hysteria about overpopulation is because students were specifically taught about the “exponential growth function” in a formal class setting, without also learning about the price system. This isn’t to say that all YouTube comments originate from the classroom; they don’t. However, the way people see the world is significantly informed by what they formally learn in class. It is amazing how much some people pay to learn really bad ideas. 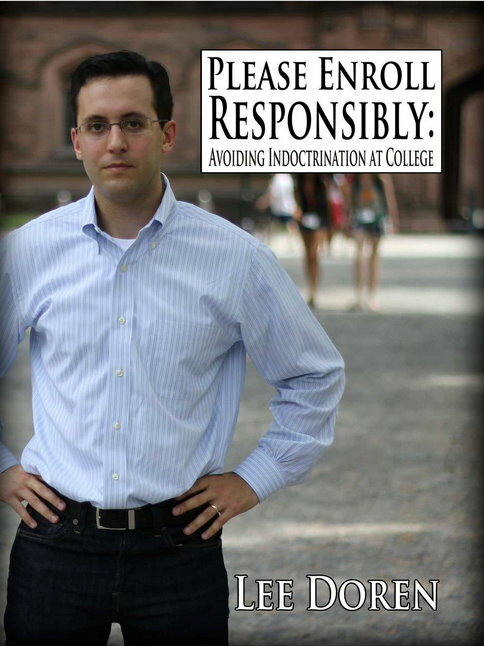 Once again, Lee Doren’s new book is called Please Enroll Responsibly: Avoiding Indoctrination at College.